Adorable Flower Crystal Buds handbag decorated with Swarovski rhinestones, it is foldable Handbag hook and it has a magnetic to keep your handbag hook tidy when it is not being used. 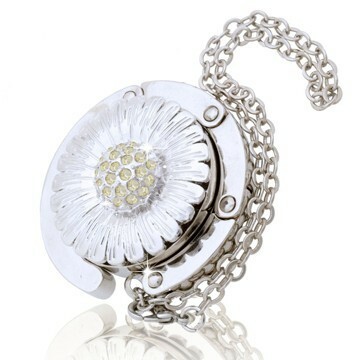 Designed specially with handbag decor surface. This handbag hook can be folded around the edge, also is extendable when you put out the hook. Can put it on the edge of a table, then the hook slides underneath to form a safe and secure place in which to hang your bag. Can be used in the cafe, restaurant, bars, lady's restroom and any other places.